In the friendly confines of Wrigley Field, there is some new tech this summer alongside the trademark bricks and ivy of the historic ballpark. Attend a game this season, and you might notice white plastic weathervanes sprouting from the pillars of the upper and lower decks, or wooden boxes with brightly colored buttons by the gates. These pieces of hand-crafted technology were built by a school just two miles west of Wrigley Field as part of the Array of Things project, an ambitious University of Chicago and Argonne National Laboratory initiative to “instrument the city” with a network of sensors collecting data on activity, environment and infrastructure. For the third straight year, students at Lane Technical College Prep High School worked with researchers from Array of Things and the School of the Art Institute of Chicago on building, programming and deploying their own sensor “nodes,” gaining hands-on experience with technologies that helps scientists better understand cities. Across Chicago, more than 100 Array of Things nodes currently collect data on temperature, humidity, air pressure, magnetic field, vibration, light and air quality, publishing the results openly for scientists, city officials and residents to use. With Lane Tech, AoT researchers have developed a pilot educational program to bring the project into schools as well, using off-the-shelf devices to help students create their own smaller version of the sensor network. While the first two years of the workshop, called “Lane of Things,” deployed student-built sensors in the hallways of Lane Tech, this year’s partnership with the Chicago Cubs presented a much higher-profile experimental setting. Students quizzed team representatives on their most pressing questions, designed custom devices for measuring sound, weather and customer satisfaction, and installed the sensors around the ballpark in late May. For ten weeks, about 100 Lane Tech students learned about urban sensing and brainstormed how it could best be used in the 104-year-old ballpark. While previous years’ projects studied local issues such as humidity in the school greenhouse or foot traffic at the guidance counselor’s office, this year’s challenge was much grander: A venue that holds more than 41,000 people and hosts at least 81 baseball games each year, in addition to other sports, concerts and community events. The Cubs wanted to put data behind some of the most common questions about Wrigley Field: How different is the weather, including wind speed and temperature, between the upper and lower decks? How much noise does the ballpark generate on game days, and how far does it spread into the surrounding neighborhood? Are the people in attendance happy with their experience at the park? Inexpensive sensors now exist to measure many of these variables. But adapting them to survive in outdoor conditions amidst thousands of baseball fans requires careful planning and design. To help, some of the original designers of Array of Things sensor nodes—Douglas Pancoast and Robb Drinkwater of the School of the Art Institute of Chicago, and Satya Basu of architectural firm Perkins+Will—guided students from graph paper sketch to final product. Divided into sound, weather and customer satisfaction teams, students built prototypes in 3-D modeling software and cardboard, iterating towards final designs that were weather-proof but still open enough to measure data from the outside world. Each team used laser etchers, 3-D printers, and more traditional “shop class” machinery to produce bespoke constructions of wood, plexiglass and plastic emblazoned with a student-designed Lane of Things logo. Aside from the technical demands, the projects offered room for creativity. The customer satisfaction boxes—offering a potential live survey of anything from the number of home and visiting fans to the length of bathroom and concession lines—needed to withstand thousands of button presses per day while also attracting the eye of attendees. Students created a base out of a patio umbrella stand, constructed large, candy-colored “happy” and “sad” buttons, and built a card slot where Cubs personnel can place different questions depending on the day and subject of interest. The Lane Tech students’ design process was a microcosm of the work put into Array of Things, which will install 500 sensor nodes on streetlight poles across the city of Chicago. As the Lane of Things project reached the deployment phase, workers from the Chicago Department of Transportation installed the 100th Array of Things node in the city at the intersection of Western Avenue and Addison Street; by coincidence, right next to Lane Tech’s campus. Each node contains a combination of sensors measuring environmental data as well as images that can be analyzed for measures such as pedestrian and vehicle traffic, intersection flooding or cloud cover. Data collected by the nodes is then released publicly through channels such as the city of Chicago Data Portal or Plenario, an open data platform developed by the Urban Center for Computation and Data, a UChicago/Argonne research center. Array of Things was primarily created as a community technology, generating valuable new data streams that scientists, governments, and the public can use to better understand and improve cities. But lead investigator Charlie Catlett, senior computer scientist at Argonne and director of UrbanCCD, also considers Array of Things an educational platform, providing a real-world instrument for students to learn about data, coding and technology in the “laboratory” of their choosing. With funding from Motorola Solutions Foundation, Array of Things and its educational partners hope to replicate the Lane of Things workshop model in schools across the city and region. This summer, they’re holding a professional development workshop for teachers from Chicago Public Schools as well as developing a formal curriculum for computer science classes across the Chicago region to work with AoT data and sensor technology. 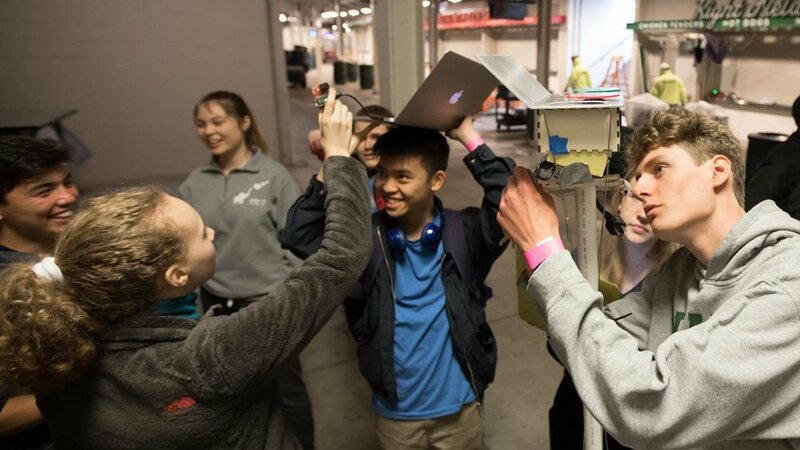 On a rainy day in May before the start of a Cubs homestand, Lane Tech students milled about the Wrigley Field concourse installing their devices, dodging keg-carrying golf carts and waving antennae in the air seeking an elusive wi-fi signal. Some technical issues aside, the sound and customer satisfaction sensors were in place for games against the Cleveland Indians and San Francisco Giants in the week before Memorial Day. Nine days later, they returned to Wrigley Field to present their work and offer tours of the sensor locations. Though technical issues delayed the placement of the weather sensors, preliminary data from the sound and customer devices provided the first harvest from the workshop. Over one stretch of four games, nearly 5,000 fans responded to the question “Did you have a good time?” at one of the five fan sentiment stations set up at the exit gates. Representatives from the Cubs organization said that they will leave the sensors up for as long as they’re functional, sharing data back to Lane Tech for future installments of the workshop.